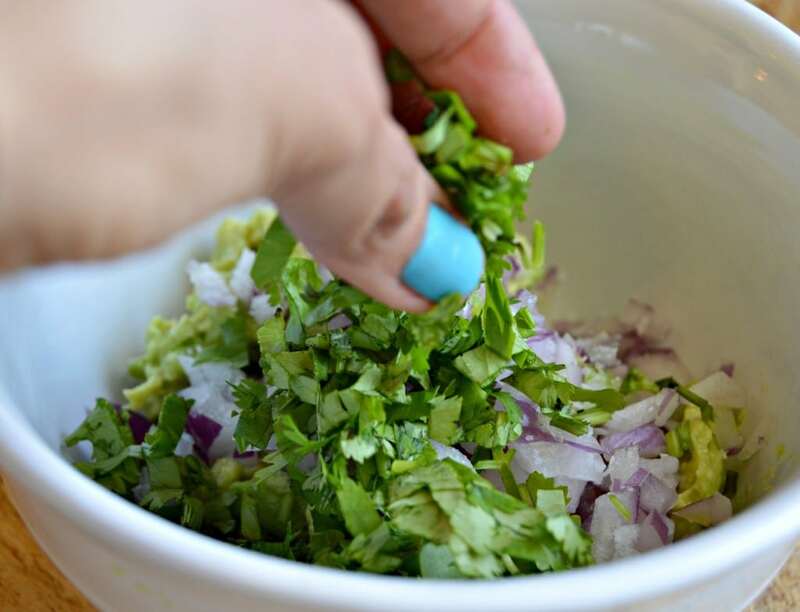 Inside: Learn how to make this delicious, homemade, and authentic Guacamole recipe with simple ingredients that my Abuela taught me how to make when I was growing up in Mexico. Also, Bonus tips for how to keep guacamole from turning brown. Guacamole is a staple of Mexican cuisine. Although it is pretty simple to make, it can be tough to get the perfect flavor. With this authentic Mexican recipe, though, you will be an expert in no time. Some of my favorite memories from my youth are when I would spend time cooking with my abuelita (grandma). She didn’t have any daughters of her own (she had 10 boys though), and that is why she always loved spending time with her granddaughters. My sister and I had the privilege of growing up in close proximity to her. That gave us the opportunity to learn so much from her. Every day at dinner time it was like a party – lots of people, lots of food, and lots of smiles. One of the most requested appetizers was always this homemade guacamole. My Abuela had an avocado tree in her yard that grew some of the biggest avocados that I have ever seen. That, combined with this delicious recipe, made for some amazing guac. I saw her make this recipe more times than I can remember. That’s why I already had the recipe memorized by the time I was about 7 years old. I always looked forward to gathering the avocados from the tree each day, and I was always thrilled when she asked me to make the guacamole. What Ingredients Do You Need to Make Guacamole? This will be perfect to take to that next get-together where you are supposed to bring something. Your guests will love it! I can’t think of any time when I have made this recipe where people didn’t ask for the recipe. It must be the combination of authentic flavors, choosing quality avocados, and making it with lots of love. How Do You Choose The Perfect Avocado For a Perfect Guac? Speaking of using fresh avocados, it is super important to choose an avocado that is not too firm, but also not too soft. Make sure you give it a quick (gentle) squeeze at the store before buying it. There should be a little bit of give to it, but it shouldn’t feel too soft. If it doesn’t have any give at all, then it is probably too firm. If you aren’t planning on making the guacamole for a day or two, then the firmer avocado will do, but just make sure that you plan ahead. One of the most common questions that people ask me about guacamole, is how to keep it from turning brown? You know the feeling – you worked so hard making guacamole, only to have it turn brown right when it is time to eat. There are a couple of different ways that I have found that really seem to work. Add the pit of the avocado to the guacamole dish. Add an extra teaspoon of lime juice. I would recommend doing all three if you can, but remember, as much as you try, the guacamole is going to turn brown if you don’t eat it relatively soon after eating it, so plan ahead! 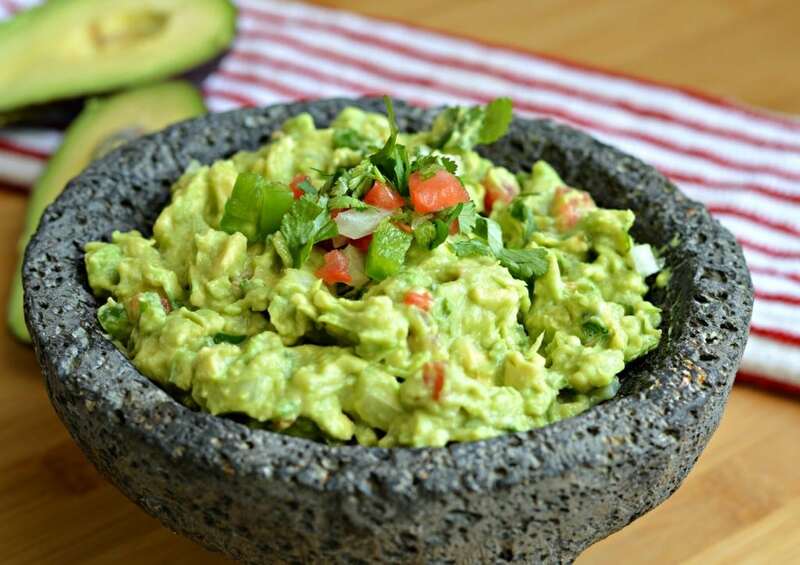 I am so glad that you made it to my site and are getting ready to try this guacamole recipe. It really is easy, but if you have any questions or run into any issues, please feel free to leave me a comment below! If you love this recipe, please rate it with 5 stars at the end of your comment! Molcajete. This is a small stone bowl that is used all the time in Mexico for making fresh salsas and guacamole. It makes it really easy to mash the avocados and is a great serving bowl as well! You can get one here to try out for yourself. Food Chopper: You will need to chop up some veggies for this recipe, so it is helpful to have a food chopper like this one on hand. It makes everything so much easier! 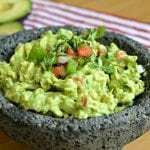 Guacamole recipe - homemade, authentic Mexican version with simple ingredients that my abuela taught me how to make. I love guacamole. These photos are beautiful. My recipe is similar to yours — I add garlic and cumin. Thank you so much for this great recipe…It seems to be easy to prepare and there fore I will try this for sure. Delicious! Just came back from Mexico and was craving guacamole. I exchanged fresh tomato for 1/4 can diced tomatos with chillis. Thank you. What do you recommend to help stop the guacamole from turning brown if you make this earlier than when you intend to serve it? Hi Sam! One thing that my grandma always did, and that seemed to work, was to save the seed from the avocado and put it in the bowl with the guacamole. Of course, it all depends on how long before hand you are going to make it. Nothing can really save guacamole from turning brown if you plan on making it the day before. Another option is to add some extra lemon or lime juice. Good luck! How much salt would you recommend for “to taste”? I’m not an avocado lover but would like to make this for my husband. Thanks! Hi Traci – I would start with about 1/2 teaspoon and then mix it in. Taste it, and if it isn’t enough, just add a little bit more at a time until it tastes right to you. Hope that helps! Oops, I just saw that you aren’t an avocado lover, so you might not want to taste it 🙂 I think that 1/2 teaspoon should be good. If you can get your husband to taste it while you are making it, that would be the safest bet. Good luck! Your description and recipe sounds so authentic I wouldn’t want to change a thing! I make guacamole a lot and am always looking for the most authentic mexican one. I agree that keeping the pit in seems to work for some reason. Also one question, is garlic ever used in guacamole in mexico? I feel like it’s used a lot in restaurants here. Hi Deb, thanks for your kind words! Garlic is not used in guacamole in Mexico 🙂 Thanks for your question. Your recipe is very similar to how my mom showed me to make guacamole with a few tweaks. I use my molcagete for everything to make the guac. I roast the garlic (skin on), onion slices and jalapenos on a comal or dry skillet for about 10 minutes, jalapenos about 15 minutes, remove skin from roasted garlic and clean off the blackened skin from jalapenos, mash garlic first then the onion lastly the jalapenos add avacados and mash all together, squeeze lime juice into guac and freshly chopped cilantro and combine all together, I top my guac with crumpled queso fresco on top and enjoy. Hi Charbel. Thank you for this great recipe. For some of us who enjoy spiciness in our guac, what type of pepper would you recommend adding, and home much of it would you recommend adding so it’s still authentic. Hi Terrence, I would recommend using jalapeno for guacamole if you want to add some spiciness. I would probably start with about half of a pepper, and then you can increase it from there depending on how spicy you want it. Good luck!